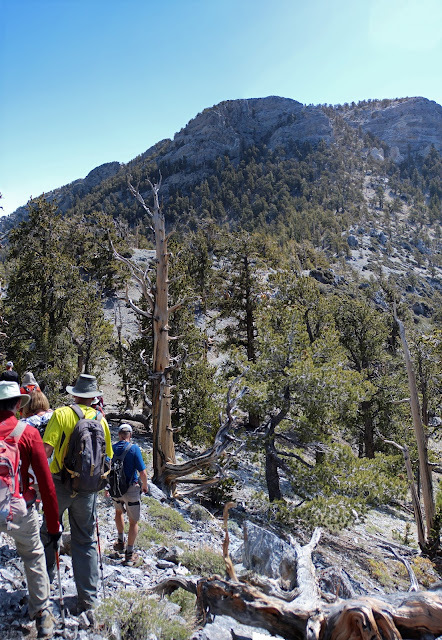 Thirteen club hikers decided, today, that the hike up to Black & White Sisters is a strenuous hike in May. 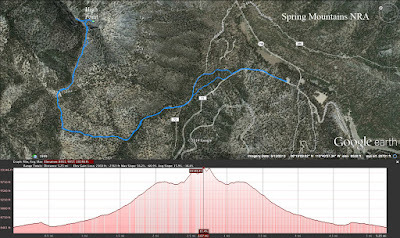 In September, it may only be a moderately strenuous hike due to the fact that we would be in better condition and more acclimated to the higher elevations at that time. 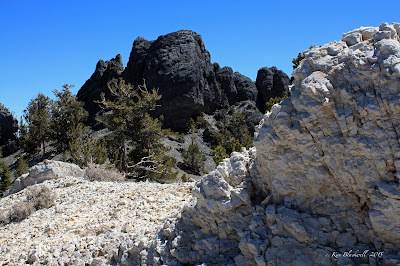 Nevertheless, all thirteen hikers made it up to that dark colored rock outcropping and over to the little white outcropping in due time. 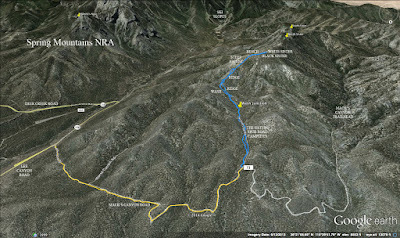 We began at the bottom of the Sisters Spur Road that turns off two miles in to Macks Canyon Road in the Springs Mountains NRA. This was only our second assault on Black Sister using this route but we made it up and back without a hitch in navigation. A few rotten trees cross the wash. Nearing the top of this wash, we veered off to the right to finish our climb. At the top, we found a very slight trail that balanced along the main ridge. We turned to our right and continued climbing. We stayed on the ridge until we were faced with "THE STEEP CLIMB." The trail continues even though it is wise to zigzag your own way up this hill in any way you can! 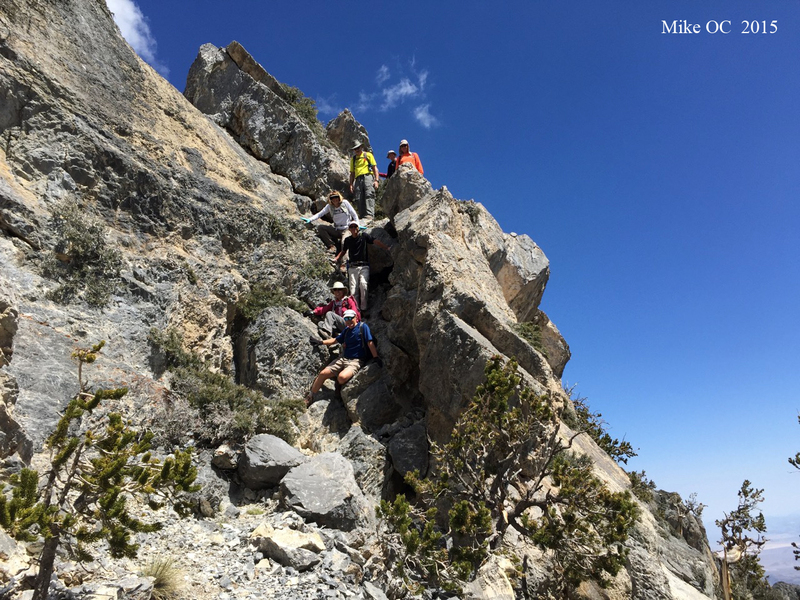 The group split with stronger hikers reaching the bench summit several minutes before the last ones crawled up. It was a great group today and everyone stuck together for the final assault up to the dark colored rock outcropping named Black Sister. At the rock, several hikers climbed to the top and a few stayed below. We all made it up that hill! The accomplishment was measured by just reaching the area! Nevertheless, we all got our names written in the log book. There were not many other names in it! Eventually, all the hikers took the small trail over to the tiny peak between Black Sister and North Sister called White Sister. 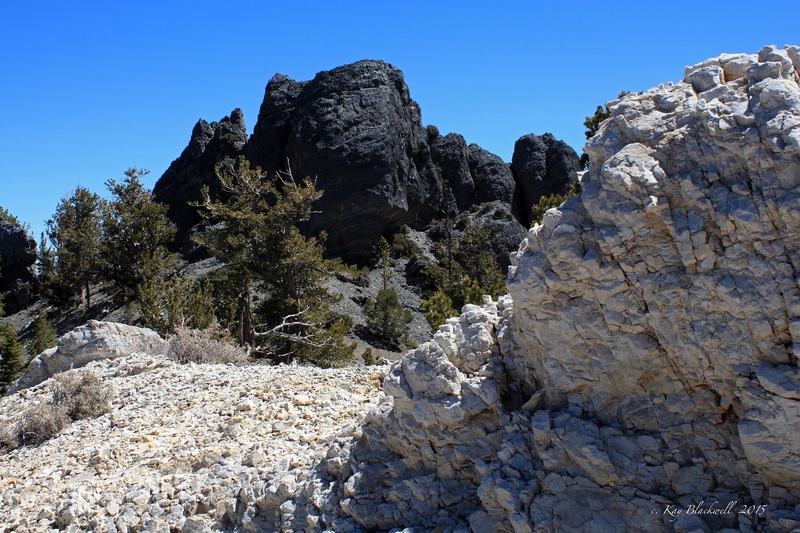 This small peak provides contrasting color for the surrounding landscape with white rocks. The views from this peak are some of the best in the Spring Mountains. All Mummy parts except for the Toe, Mt. Charleston, Lee Peak, Mack's Peak, McFarland Peak, North Sister and South Sister are clearly in view. We enjoyed our break very much as several of us may never choose to climb that hill again! Concentration on the steep down climb was palpable. Occasionally, we called out warnings to our fellow hikers. We do try to take care of each other. We followed the small trail along the main ridge together then found a reasonable way to drop down into the wash filled with pine cones. Gathering again at the ponderosa cairn, we started down the little Sisters Spur Road to the cars. A challenging yet enjoyed morning. 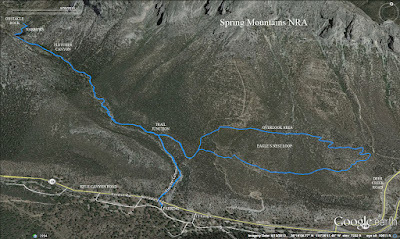 Last year, the Spring Mountains NRA refurbished a 1.86 mile loop trail that circles above and to the right of Fletcher Canyon. 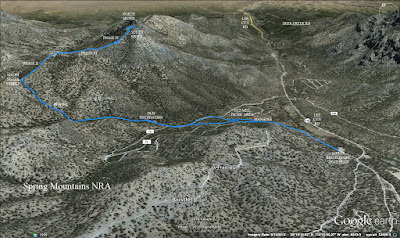 They named it the Eagle's Nest Loop for the high and wide overlook afforded from the upper portion of this trail. It is well signed and twelve hikers added this to their foray into Fletcher Canyon today. We started out from the Fletcher Canyon trailhead on Kyle Canyon Road and turned right onto the Eagle's Nest Loop Trail about one third of a mile up. 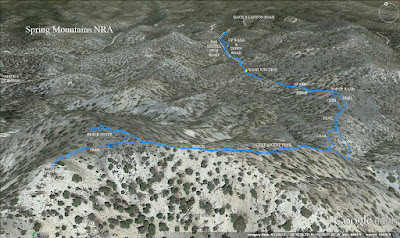 The trail climbs up to a plateau then divides. The loop can be hiked to either the right or left. We took the left fork which allowed us to do the switchbacks that came later going down. From the top of the loop, we had a wide view of Kyle Canyon and the South Loop side. We had a good perspective of the 2013 burn area and avalanche routes from 2005. Chris told us his story about a wicked hike up to one of the caves above us from years past. 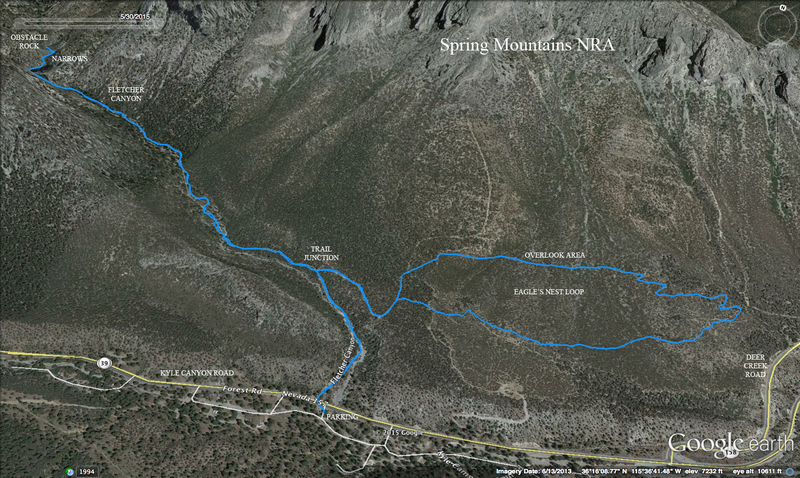 We passed several cliffrose bushes that were in bloom and hiked through groves of manzanitas. At one place, there were a lot of old water pipes that the trail cutters had used to keep the trail from washing away. We completed the loop, turned left onto the "balloon string" of the route and followed the trail back down to the Fletcher Canyon Trail. 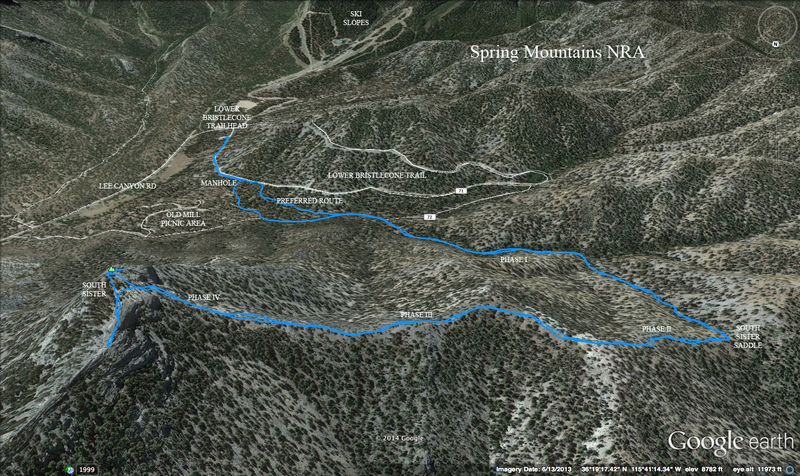 Today's hike was done at a somewhat leisurely pace. We stopped several times. 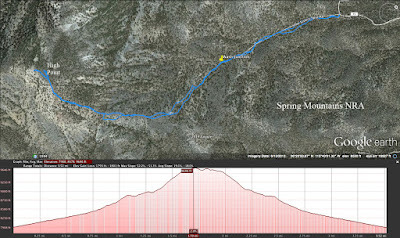 The weather was hot, around 80 degrees, which is quite warm for the Spring Mountains. 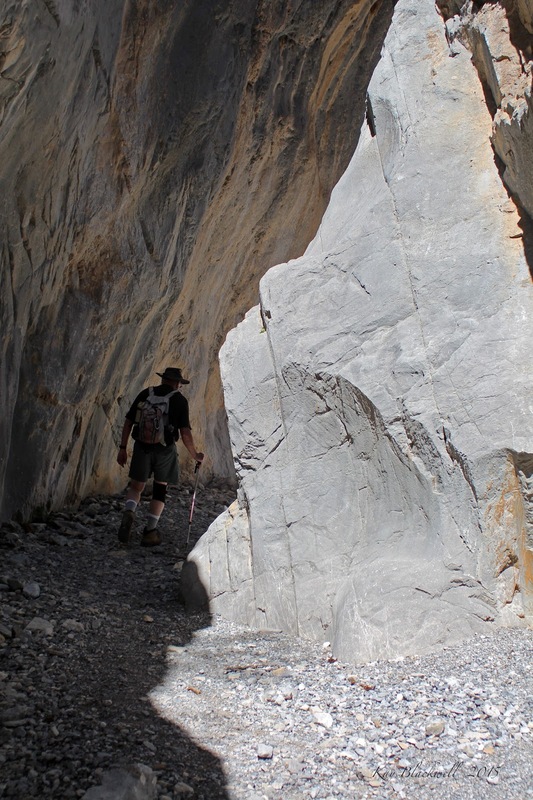 The Fletcher Canyon Trail leads up through an ever-narrowing limestone canyon. 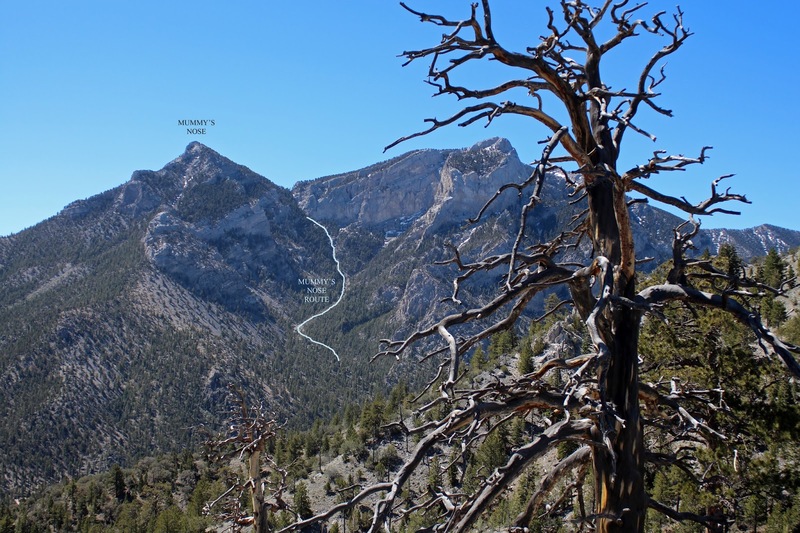 The trail parallels the center wash until hikers forge into the narrows portion of the canyon. Then, the hike becomes a climb up through the wash that sometimes has water flowing down through it. The canyon was dry today. And, the sunlight and shadows played along the gray walls. The narrows squeeze the canyon together so much at around 2 miles up from the trailhead, that a huge boulder that rolled down from above got stuck here probably many many years ago. That boulder became known as Obstacle Rock. The canyon was very pretty today with the sunlight and new spring leaves growing on the trees. Canyon Wrens were very vocal and flew from here to there above us. After a nice long break, we started back down the canyon passing several pairs of hikers along with two large groups and a few dogs. The new Spring Mountains Gateway Visitor Center was having its Grand Opening today and crowds of people were in the mountains enjoying the relative cool from the desert below. We were glad that we had started early. 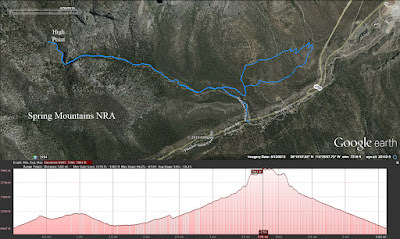 Seventeen hikers drove up Lee Canyon Road in the Spring Mountains NRA and parked at the Lower Bristlecone trailhead for a hike up to the peak of South Sister, the southernmost peak on a ridge filled with small craggy peaks. We chose to begin at the aforementioned trailhead even though the Old Mill Picnic Area construction has been completed and hiking through this area is allowed. We knew that we had too many cars to fit in the small parking area assigned for this purpose found just outside the picnic area fee booth. 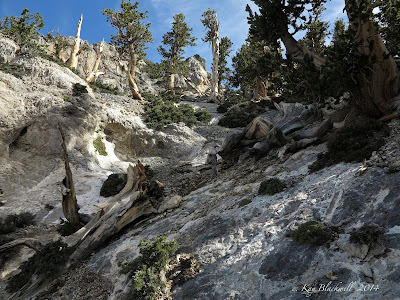 Therefore, we started hiking up the forest road that is known as the Lower Bristlecone Trail. Not far up the road, there is a manhole on the right side followed by a well worn path leading down the hill. This was our exit. 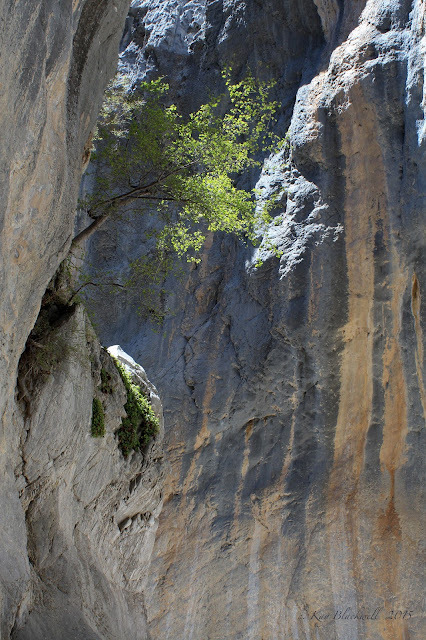 We crossed through the picnic area and found the rock-lined trail on the other side that leads up through the small canyon area. Soon a vague trail forks off to the right. This is the South Sister Trail. 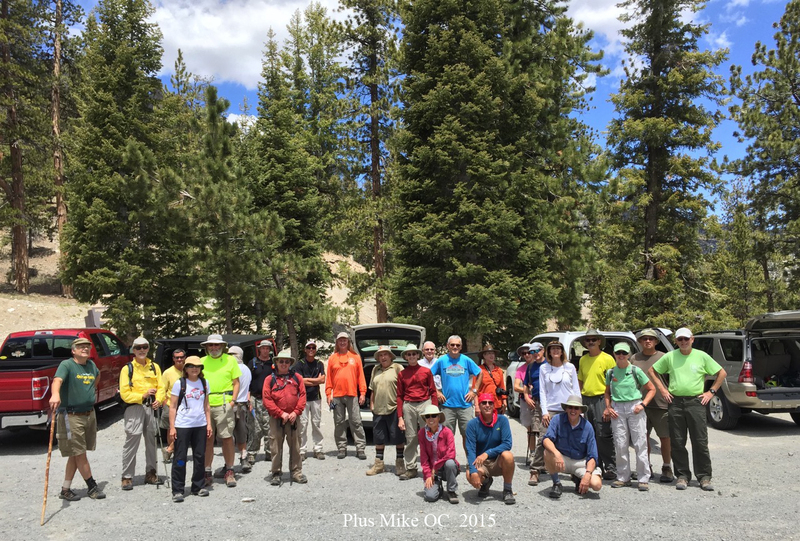 Phase I of the South Sister hike is the longest of four phases. The route travels up a trail next to two different washes. The first wash is a main wash flowing down from the ridge. The second wash turns off to the right and is a small wash coming off of a saddle above. The higher we climbed, the steeper the trail became. Finally, we all reached the saddle where a convenient log offers a few seats. Phase II of the hike turns up the ridge to the right. There is not a real trail here. 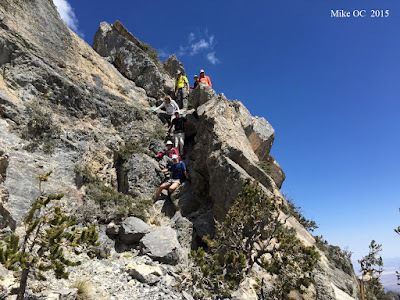 Just keep going up until you reach the next saddle ridge area. We gathered again now ready for the Phase III relief. Until this point, the climb had been tough but not as tough as what was coming up in Phase IV! Phase III follows a small trail around the ridge to the right. Up, down, up, down on the craggy limestone trail. 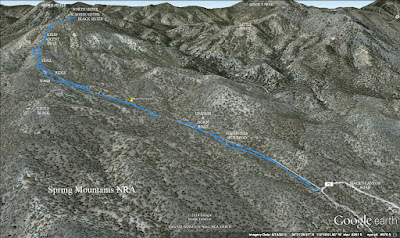 At the end of the ridge, two hikers bowed out of the final assault, also known as Phase IV. While those two hikers searched for a perch, the rest of the group began climbing the steep scree among the old weathered bristlecones. Their voices could be heard all the way up the hill and across the narrow peak. Although the climb is daunting, the scenery is the most beautiful and awesome of the entire hike. 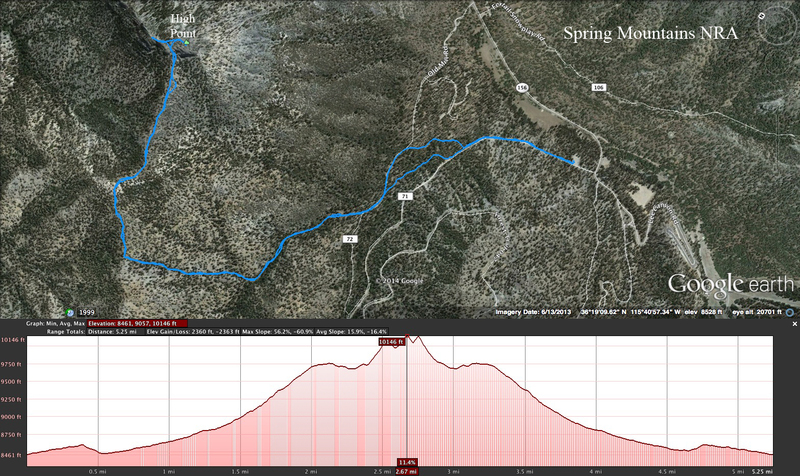 Still, along with that climb comes a steep and slippery down climb on the descent. And, down they came ... a bit quieter than on the ascent earlier! Meeting the two hikers at the bottom, the group continued out along the ridge of Phase III and gathered once more at the top of Phase II. This is the most difficult part of the navigation of the hike. 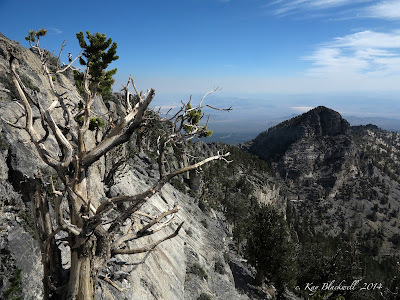 Normally, hikers must balance the flattish ridge all the way down to the saddle. Erring should be done on the left side. Today, we followed our club president, Steve, down a different and more precipitous route by intentionally dropping to the left in a big way. It was very steep and the writer decided it was not her favorite way to descend South Sister! 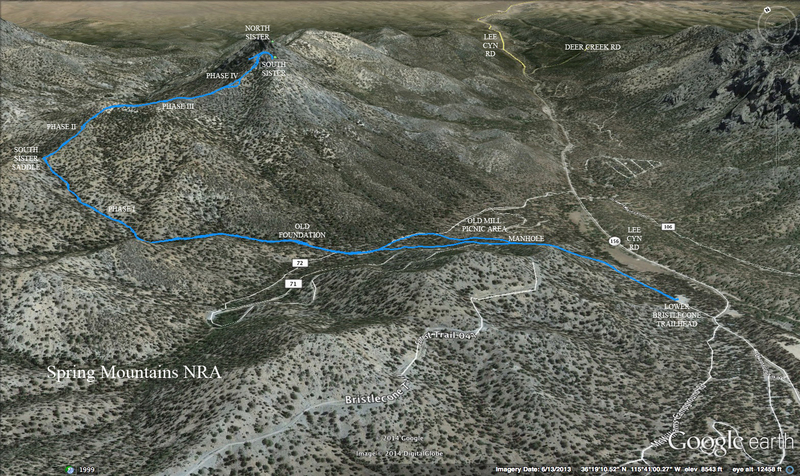 Nevertheless, this route did finally intercept with the Phase I trail near the bottom of the higher wash. The trail led us the rest of the way. Back on the forest road, we hiked into the parking lot at the very same time that the optional hike (Bristlecone Loop) finished. 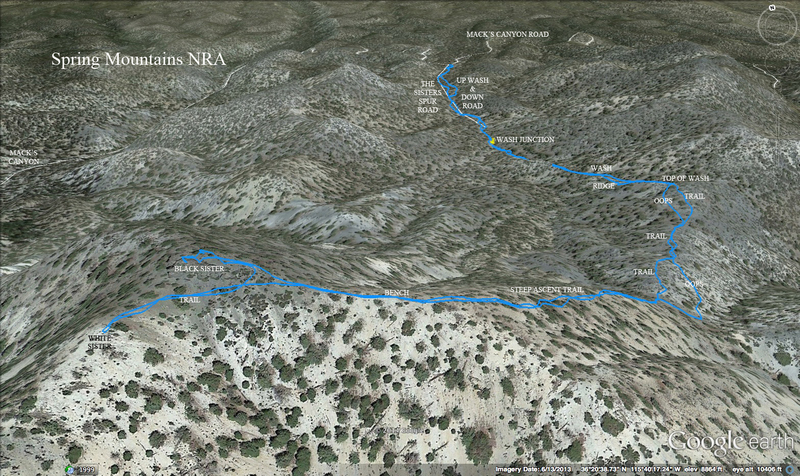 At the bottom of this entry, there is a photo of the two groups of hikers at the end of their respective hikes. Fun day with friends.